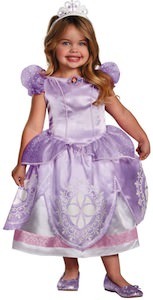 With many hearts capturing Disney Princess Sofia the First is another fan favorite. 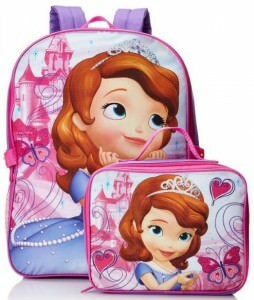 This is a backpack and lunch kit that both feature a detailed image of Sofia the First in her glitter-filled dress, a sparkling tiara with a background design that has the tall castle, hearts and a butterfly all in soft pastel colors. The backpack has one large main compartment that fastens with a zipper and has a mesh side pocket to fit water bottles, drinks or small snacks. The lunch kit opens easily and closes shut with a zipper, it also has a carry handle and is made to easily clip to the matching Sofia the First backpack. Perfect for back to school, trips, picnics or many occasions.